If you have a cat, then you likely know how independent felines can be. They can be cute and snuggly when they want, but they’re often happiest when they’re napping on their favorite blanket or in a prime spot of sunshine. There are some cats that want to go outside, whether it’s to explore or to test their natural hunting instincts. Whatever the case may be, it’s important to be aware of the dangers that the outdoors can pose to an indoor house cat. At Loveland Veterinary Clinic, we’re here to provide treatment when you need it most. If you let your cat outside, then it’s good to remember that it can easily encounter other animals. It may go in search of other cats, or it may wander into a yard that’s populated with dogs. In Colorado, there’s always the chance of your cat encountering a wild animal, and it may not be quick enough to elude a hungry predator. It can be tough to keep tabs on your cat when it’s outside, which is why it’s always a good idea to have a microchip implanted under your cat’s skin. If someone finds your cat, then they can have the chip scanned and your cat can be returned to you. It’s also smart to keep a collar on your cat with up-to-date tags that include their name, your address, and your phone number. However, if your cat encounters another animal, then there is the chance that the collar could be torn off, which is why a microchip is the best way to go. Some cats want to go outside in search of a partner. Cats who are not spayed or neutered will eventually want to breed, and if you let your cat outside, then there is the chance that it will find a mate. Male cats can breed with multiple females, and your female cat could come back pregnant following an outdoor adventure, without you knowing which male cat is the sire. The easiest way to avoid an unexpected litter of kittens is to have your cat spayed or neutered following adoption, or when it’s reached the appropriate age. You can have the surgery completed at our vet clinic, and you won’t have to worry about your cat breeding while it’s out and about. 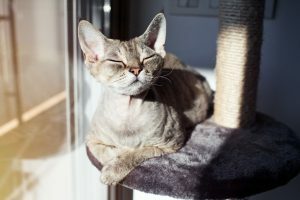 You may give your cat tick and heartworm medication, among other things, but if you let your feline friend outside, then the possibility exists for it to encounter other insects that carry different types of diseases. If your cat drinks contaminated water or is bitten by a certain insect, then it could be at risk of developing a serious disease that may require treatment and medication. 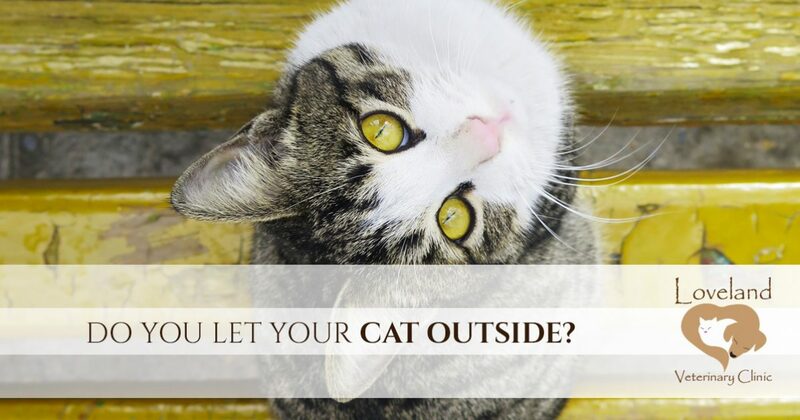 If you’re worried about your cat going outside, then there are precautions that you can take to protect it from harm. Some indoor cats don’t have the skills to survive outdoors, and it can be a good idea to keep those cats inside at all times. Other cats may just want to roam the perimeter of your home or lay on the deck in the sun, and are never out of their owner’s sight. At Loveland Veterinary Clinic, we want your pets to be safe at all times. If you let your cat outside because you’re afraid it’s bored or getting too obese, then there are things you can do to make the inside of your home more exciting and exercise-friendly. If your cat needs to be spayed, neutered, or chipped, then we can help with that as well. We look forward to taking care of your cat!